PLEASE NOTE: A NEW, REVISED EDITION OF “WOODWORKER’S GUIDE TO SKETCHUP” IS NOW AVAILABLE. Woodworker’s Guide to SketchUp is a unique method for learning how to use SketchUp, a free 3D modeling program. Thousands of woodworkers all over the world have shortened the learning curve and started designing and planning their projects by building a three-dimensional model before heading to the shop. Modeling is much like building, and SketchUp allows you to explore design options and work out joinery without the risk of wasting precious shop time or valuable materials. This guide, in Adobe PDF format takes you step-by-step from setting up the program to making projects, including any desired level of detail. It skips the architectural stuff and shows you how to make pieces of wood the correct size and shape, put the parts together and add details such as mortise and tenon, dovetail and cope-and stick joints. You’ll learn to solve design and build problems and how to extract detailed information about every piece and detail from your completed model–valuable information you can print and take to the shop for reference. This isn’t just a print book in digital format. Within the 184 pages are 50 short video lessons embedded every few pages. These short videos reinforce the text and screen-shot illustrations. The table of contents contains links to each chapter, topic and video in the book. Going back to review a technique is simple and painless. Woodworker’s Guide to SketchUp is available in two different ways, as an instant download or on a disc sent to you via US Mail as a First Class Package. 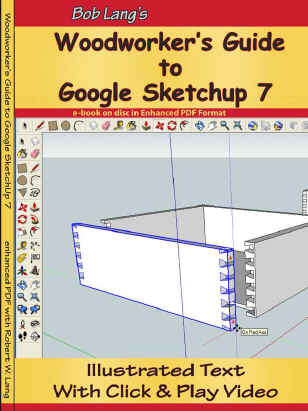 THIS BOOK IS NO LONGER AVAILABLE, CLICK HERE FOR INFORMATION ON THE “NEW WOODWORKER’S GUIDE TO SKETCHUP”. If you experience any problems with ordering or downloading, send me an e-mail by clicking on my name below. Milty, the link seems to be working from my machine. Send me an e-mail and I can send you a “request for payment” that will hook you up. I am having the same problem Milty is. It just takes me to the pay pal home page and askes you to sign up for pay pal. I’m not sure why this happens, but the easy way out is to simply send me an e-mail to let me know. I’ll send a “Request for Payment” through PayPal, and when you complete the payment, I’ll e-mail you a link to get the download. It might take a few hours if I’m in the shop and away from the computer, but I’ll make sure you get hooked up.